Vera Farmiga attended the 2015 Critics’ Choice Movie Awards held at the Hollywood Palladium on Thursday (January 15) in Los Angeles, California. 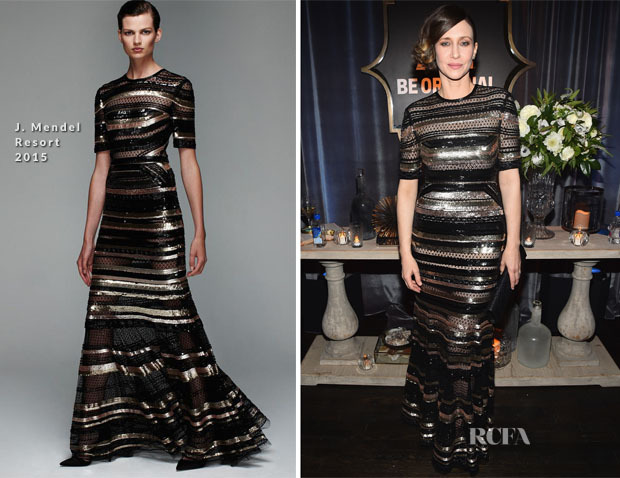 The actress, who was one of the presenters on the night, wore a J. Mendel Resort 2015 black and rose-gold embroidered cap sleeve gown with a streamline dramatic profile, which clings to the hips and relaxes into a flared skirt. This look instantly made me think of her last red carpet look as it also features horizontal stripes, but this one has more razzle dazzle.